Earn up to 72 reward points. Chorales and warm-up exercises for tone, technique and rhythm. 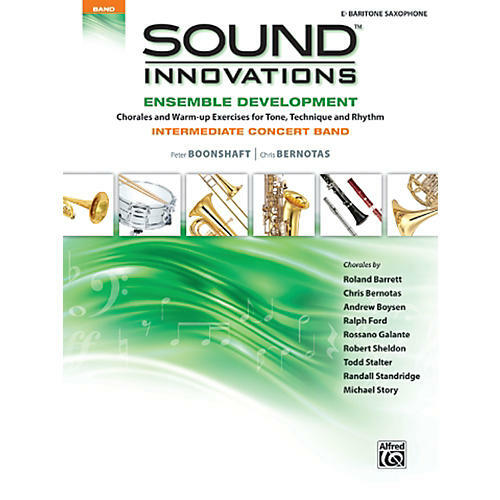 Sound Innovations: Ensemble Development is a valuable resource for helping your students grow in their understanding and abilities as ensemble musicians. It contains 412 exercises, including more than 70 chorales by some of today's most renowned concert band composers. An assortment of exercises is grouped by key and presented in a variety of intermediate difficulty levels. Where possible, several exercises in the same category are provided to allow variety, while still accomplishing the goals of that specific type of exercise. You will notice that many exercises and chorales are clearly marked with dynamics, articulations, style, and tempo for students to practice those aspects of performance. Other exercises are intentionally left flexible for the teacher to determine how best to use them in facilitating and addressing the needs and goals of their ensemble. Whether your students are progressing through exercises to better their technical facility, or challenging their musicianship with beautiful chorales, this book can be used after any band method or as a supplement to performance music. Contains chorales composed by Roland Barrett, Andrew Boysen, Ralph Ford, Rossano Galante, Robert Sheldon, Todd Stalter, Randall Standridge, and Michael Story.